Blimey. Five days ago we hadn't even played our quarter final. Now we're two days away from a cup final day out in Tokyo. When you've spent most of the days in-between drunk and/or bloated on Christmas gorging, it's more than a little surreal. I guess that's the unique magic of the Emperor's Cup! We played with a confidence and verve that surprised even me. We battered Osaka for long periods, and when they did launch attacks of their own, Kaito, who has stepped into the space left by the injured Nishibe, displayed safe hands time and again. 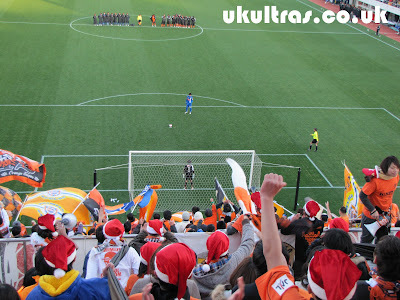 Ono was a class above as usual, and the impact of the lack of Endo for the visitors was clearly apparent. Johnsen seems to like Ecopa, and he was on hand again to nod home his second and third goals at the Fukuroi stadium this year. I'll keep it short because I'm tired, hung over and worn out from all that sambaing. Well, we ran around with a purpose and intent I've not seen for a while. We swept around the field with confidence and always looked like winning. 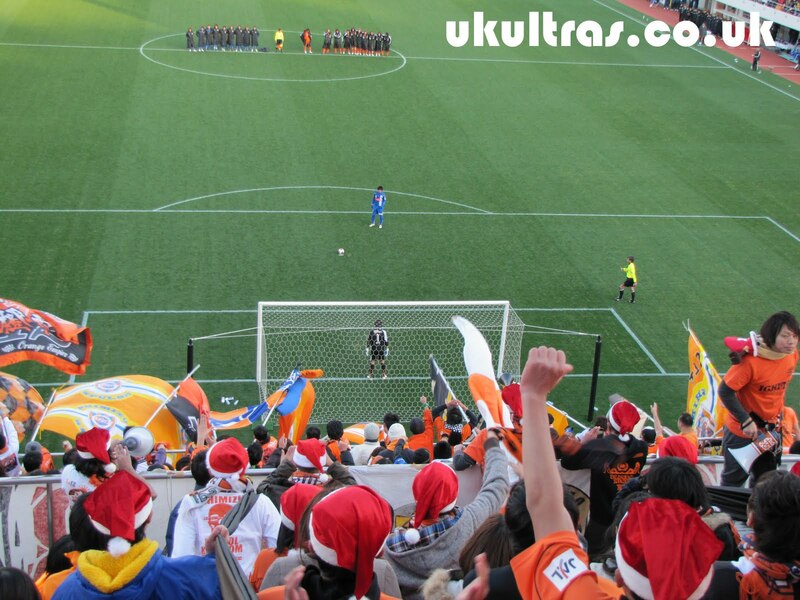 If we can recreate that on Saturday I've no doubt we can win it against the Antlers. 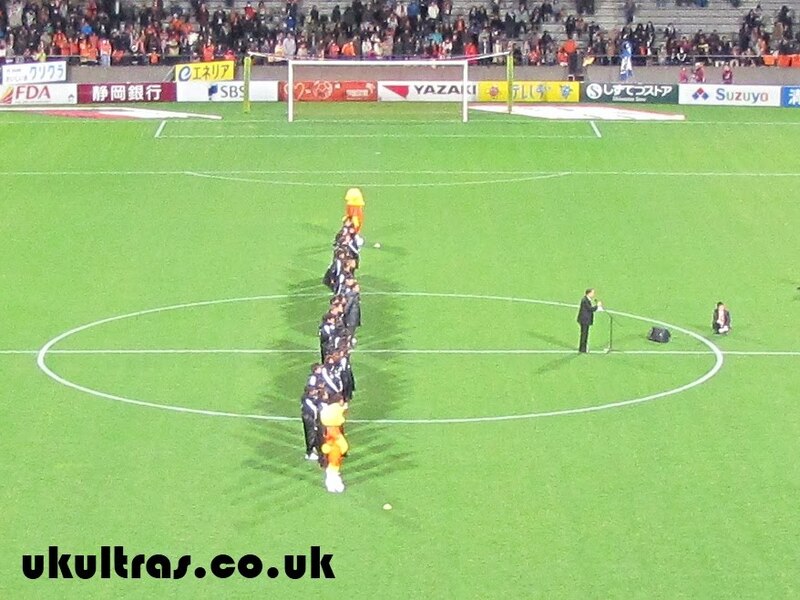 We're yet to lose to Kashima this season and owe them for the 2000 final when they did us 3-2 after extra time. The 90th Emperor's Cup. 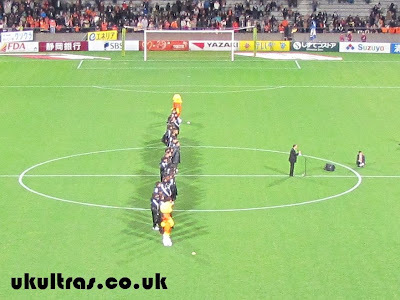 2010 Final: Kashima Antlers versus Shimizu S-Pulse. Two of the five ever-presents in J1 face off together for more than the Emperor's Cup title. Also at stake is the fourth and final ACL berth. The game is totally sold out but my ticket is safely stashed under my pillow, so you can be assured of a full report on Sunday (or sometime in February is we lose). Soneone's video of Johnsen's opener. I took a video which happily coincided with Hyodo's bullet strike. The big fella makes it 3-0 with his second of the day. While I'm here, Nagasawa and Hiroi have been loaned out to J2 outfit Roasso Kumamoto for a year, while Takagi has left for Consadole Sapporo. Well, that was a novel way to spend a Christmas afternoon. :) Due to the way the calender fell this year, it was all down to Daira on the 25th for the quarter final of the cup. 90 minutes in the bitterly cold wind, followed by 30 more of extra time, more than once I considered the warmth of my kotatsu and a nicely chilled Asahi. But we're lucky in Japan in that there are very few games held in the winter months, so if I couldn't rouse myself to shout us on to the semi finals, I wouldn't be much of a fan, eh? It was a long old haul, but we saw it through. The tension going into the second half of extra time exploded when Yamagata took the lead through Tashiro. It left us stood staring in silence at the blue and white masses cavorting around the terraces. It was a scene of euphoric bedlam that would have been pretty impressive were it not so sickeningly annoying. But we were soon jumping around hugging total strangers thanks to the big fella Bosar. He rose to flick a corner into the top right which sailed majestically past the despairing keeper. After a couple of close calls for both teams, to penalties it went. All five of our heroes hit the net, and with Yamagata's second kicker's effort being stopped by Kaito, our season is extended another four days. Wednesday we're all off to Ecopa to face defending champions Gamba Osaka in what is our fifth cup semi final appearance in three years. Only once out of the other four did we get through to the final, so the law of averages is surely on our side! :-D See you there! News broke this morning of the capture of ex-national team forward Naohiro Takahara. The hugely popular player, who made his name playing for some second rate team in blue, plied his trade in Europe between 2001 and 2008. After an unsuccessful spell at the car crash of a club that was Urawa circa 08/09, he escaped from Saitama in July and has since been playing in Korea for Suwon Bluewings. He's bagged 4 goals in 12 games for the K. League side. Takahara will no doubt be looking forward to playing alongside fellow Shimizu educated, Shizuoka lad Ono. In a stable, familiar, and most of all supportive environment, I'm confident we'll see a better side to him than what we saw in Urawa. "There's only one team worth playing for in Shizuoka these days, and it sure as hell ain't Jubilo" the 31 year old wasn't quoted as saying. Read the official news release here. Hot on the heels of the news of their signing by Kofu, it's been announced that Teruyoshi Ito and Daisuke Ichikawa are to be decorated with the prestigious S-Pulse Honour Award. Ito has racked up over 600 appearances in both league and cup, with Ichikawa on 406 in all competitions. Together they've accumulated 30 years of service for the mighty Oranges. Impressive, and clearly deserving of the recognition. Teru and Ichi join a select few, including such club legends as Masaaki Sawanobori and ex-manager Steve Perryman. They'll be presented with their awards at the conclusion of Saturday's Christmas Day Emperor's Cup extravaganza versus Yamagata. Teru and Ichikawa, released at the end of the season, are both ensured of top flight football next year. Each look set to be signing for newly promoted Kofu. This is both a great acquisition for Kofu, and good news for the pair's many fans at Nihondaira who won't have to go far to see them next term. I'm going to go on record now and say that our away fixture in Yamanashi next season will sell out, and Kofu will avoid pulling a Shonan and stay up without too much difficulty. If I'm wrong I'll just come back and amend this posting in a year's time. Edamura's future was the subject of some speculation recently, but that seems to be at an end today with word apparently out that he's staying. Following yesterday's capture of Takagi, today's good news is that S-Pulse are looking set to win the race to sign national team defender Taisuke Muramatsu from Shonan. Muramatsu is a Shizuoka lad born and bred, so welcome back to the fold, fella. Nagahata has signed for J2 basement club Kitakyushu. After joining from university in 2008 Nagahata has been unable to make any impact on the first 11. Good luck to him down south. 19 year old Toshiyuki Takagi has signed from Tokyo Verdy. The teenage midfielder has represented Japan at Under 18 and Under 19 level and bagged 6 goals in 25 games for Verdy this season. Welcome aboard the mighty Orange machine! Okazaki, who is rumoured to be off to Germany, has broken his nose in training. However, he'll be fit for the cup 1/4 final with Yamagata next week. It's Ghotbi Perfect! Afshin Ghotbi - Welcome to S-Pulse! Today S-Pulse announced our new coaching staff for 2011. As expected, Ghotbi takes the role of manager. Check out his full impressive CV here. Welcome to any readers from Iran! Personally I can't wait to to see how Ghotbi takes to the job. Joining him is Takashi Kiyama who becomes head coach, with Tomofumi Kuriyama as assistant coach. A new physical, goalkeeping and additional coach have also been announced, full details available in Japanese on the official homepage. In other news, Kashima have woken up to the fact they're a spent force and are trying to lure our Takuya Honda away. He's still under contract, so it'll cost them. The fella is instrumental to our midfield, and sure to play a central role under the exciting new regime, so hopefully Takuya will do the right thing, and tell Kashima to stick it. Nishibe is out for four weeks following his horrific collision last weekend. Should we make it through, will he be back in time for the cup final on New Year's Day? What am I, Mystic Meg? Aoyama has signed for Yokohama F. Marinos. 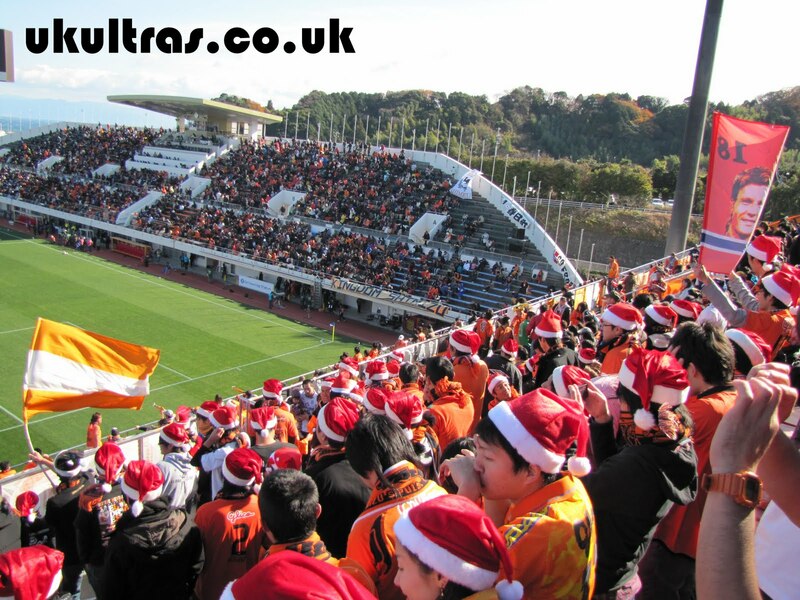 Ex-scum striker Takahara is rumoured to be on the S-Pulse Christmas shopping list. Shizuoka lad born and bred, and Shimizu educated, it was always such a waste he got tempted to the dark side as a youth. We've all done things we regret. Will he find salvation in a bright orange t-shirt? Would certainly put some extra bums on seats and flog a few scarves. Jungo Fujimoto was named tonight in the best 11 in the annual J. League Awards. Despite playing all year as a member of the top three, he was included as a midfielder. Sure he's not complaining, though. Congratulations, fella! Now sign a new contract - you know it makes sense!! We reprised our annual award of Best Pitch, and rightly so. This is the third year running, and fourth time in total. The surface is near immaculate after a full season of league and cup games, so top marks to those who work so hard keeping it looking so good. Full details here (in Japanese). In other news, although known for weeks, it was officially announced today that Teru, Johnsen, Nishibe and Ichikawa's contracts won't be renewed for next year. Kim Dong Sub, who has been on loan at Tokushima, has been transferred to Gwanju FC in his native Korea. Distasteful image of the day? Gamba Osaka players cavorting along the sideline, their fans waving their arms around in a perfectly choreographed victory dance, all while Nishibe is stretchered off to a waiting ambulance. The mindless group mentality and lack of compassion or concern as an obviously hurt player lay motionless was quite the chilling image. It's not one I hope to witness again. Personally, it left quite an impression and the fear for our keeper's health overshadowed most the remainder of the game. As for the match, we were beaten by the better team, plain and simple. Kenta's reign is coming to an end, and the new era of Ghotbi and Kiyama is, to my mind, a pretty exciting prospect. Yes, we're letting some old faces go, but as part of the mission to turn us from also-rans into a genuinely competitive outfit, I'm behind the club's efforts 100%. Of those leaving, Teru didn't get on, Ichikawa was very average, and Aoyama also never made it on. Nishibe, as mentioned, was stretchered off early on after a bone crunching collision with Arata. We finished the season in 6th, actually better than last year, but with the distinct impression of going nowhere. We still have every chance in the cup, and who knows? Maybe Kenta will go out with a final blaze of glory. Three weeks off until the quarter final is probably just what everyone needs. On the bright side, if you think your teams has problems, it could be worse. FC Tokyo lost away to relegated Kyoto while Kobe leapfrogged them to safety with a 4-0 away thrashing of Urawa. After Urawa fans upset some thin-skinned Tokyo supporters with a banner congratulating them on the 2011 Tokyo Derby being in J2, ironically it was Urawa's own burgeoning shiteness which was the deciding factor in ending Tokyo's 10 year spell in the top flight. As the 4th best supported team in J1, their demotion is certainly the biggest news this weekend. Why you'd bother watching, I don't know, but here you go anyway.